FOR GENERATIONS, COMMUNICATION DESIGNERS have worked for clients within every industry and increasingly, these designers are collaborating with their clients as partners rather than service providers. 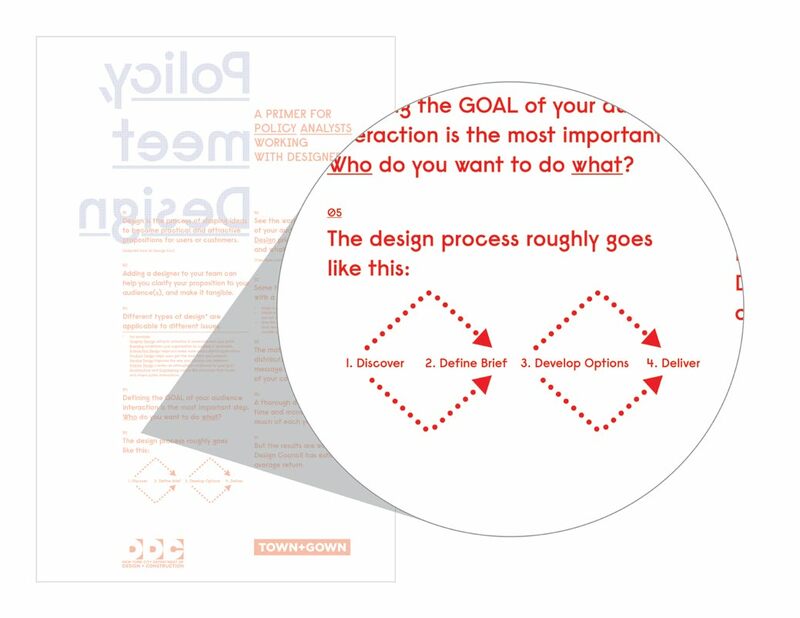 Although they are often seen as possessing unique problem-solving skills and adding an important perspective to a multidisciplinary team, communication designers’ approach might seem foreign — even intimidating — to their collaborators. I witness this every spring, when I co-teach a hybrid communication design-policy analysis course at Parsons The New School For Design. The students usually seem excited to work with people outside of their discipline, but they openly admit to little knowledge of the other’s processes. I have been eager to discover a tool that could aid in this process - some have dubbed it a “Rosetta Stone” to remove barriers between these disciplines during these kinds of collaborations, both in and out of the classroom. Design and policy students presenting to their client. 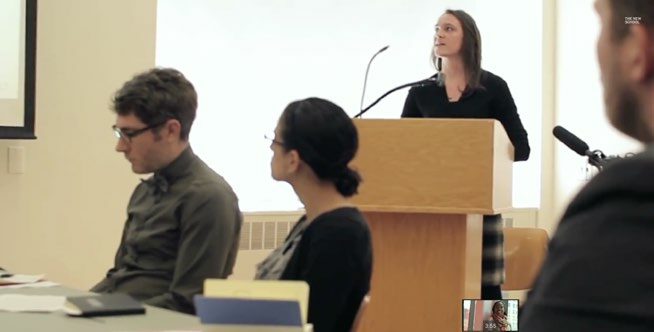 This hybrid course includes policy students who are part of the Urban Policy Lab, a class offered at the New School as part of its graduate program in urban policy analysis and management. Directed by professor Alex Schwartz, the Lab is required of all students in the program and is taught by four or five faculty members, depending on enrollment. Several of the 16 to 20 Lab projects carried out in each of the past two years combined policy analysis and design, in collaboration with design students at Parsons. The urban policy students who are part of this collaboration work in large part under the supervision of Jeff Smith, professor of politics and advocacy. The urban policy students analyze complex policy or management issues, while the design students that I teach as part of “Visualizing Urban Policy” focus on using communication design to translate the policy analysis into systems, services, and forms that enable more people to understand and benefit from it. Since spring 2013, students in this collaboration have worked on projects with clients from government organizations, nonprofits, and community-based organizations. They have recommended alternative uses for outdated and underused pay phones in New York City as part of a city-wide competition, designed a youth program that leveraged place based installations in high-crime areas, helped an immigrant day laborer organization grow sustainably, designed an awareness campaign about the need to parole elderly prisoners, advised developers with strategies that prioritized sustainable building solutions when selling their air rights, designed an awareness campaign to help immigrants understand NYC’s affordable housing lottery system, and designed an app that connect at-risk youth with free and safe services and that are offered in their neighborhood and throughout NYC, among other projects. 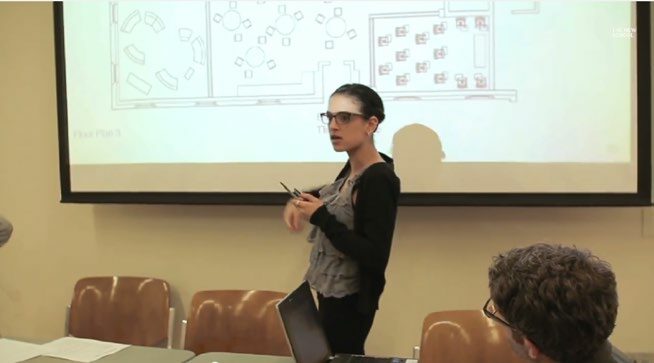 The policy students begin each of project with a rigorous analysis, while the Parsons students work through design thinking exercises that help them to research and understand the problem followed by design making, when they visually translate the policy recommendations. We talk with our students about how each discipline can contribute to projects, but that only alleviates some of their concerns about the collaboration. 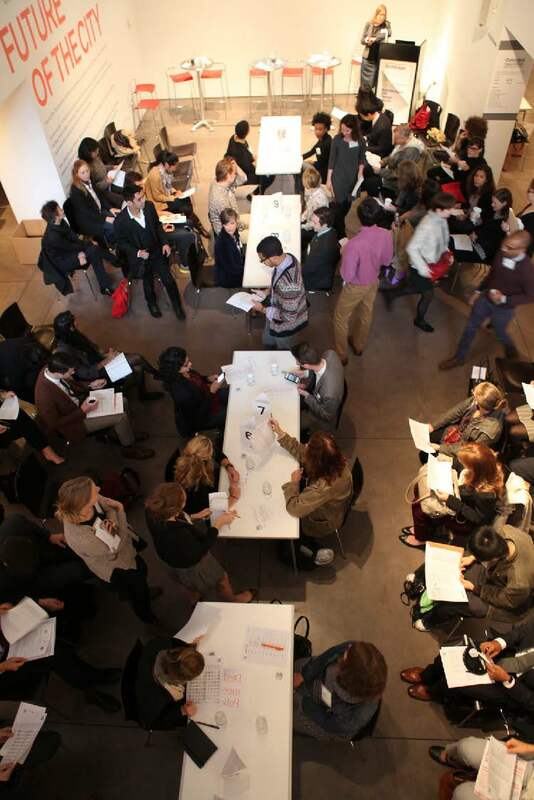 The two groups come to projects at different stages of their careers: the designers are mostly undergraduates, while the policy students are in the graduate program and usually have part- or full-time jobs. Students are also used to working in their discipline’s silo, which influences how they work, their priorities, and expectations for the collaboration. For these reasons, we regularly discuss how each group can collaborate more effectively, using the advice-filled “Rosetta Stone” poster as a core resource to help translate the nuances of each discipline during those discussions. This event poster resulted from the “Policy, Meet Design” event that was held in October 2013 at the New York Center for Architecture as part of Town+Gown, an ongoing initiative of the city’s Department of Design and Construction. Terri Matthews, Town+Gown director, described the poster as “a tool to help practitioners on each side of the policy-design gap learn more about each other.” Conceived as a “top 10” list of tips, the double-sided poster offers a primer for designers who work with policy analysts on one side, and an analogous primer for policy analysts who work with designers on the other. 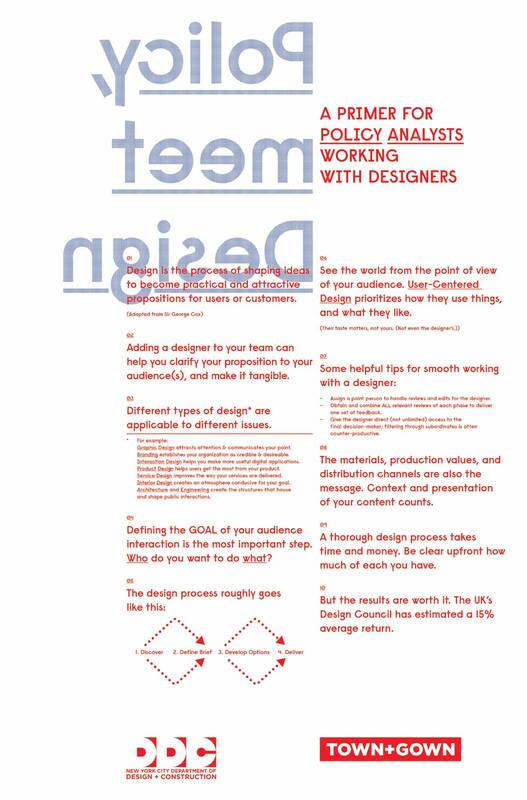 Nearly 20 people — including my teaching partners and me — contributed insights to the poster, all of which was distilled into the two sets of ten points Both sets cover a range of topics: objectives of the work and their working process, issues of scale, how each considers audience, and the added value of each approach, among other topics. 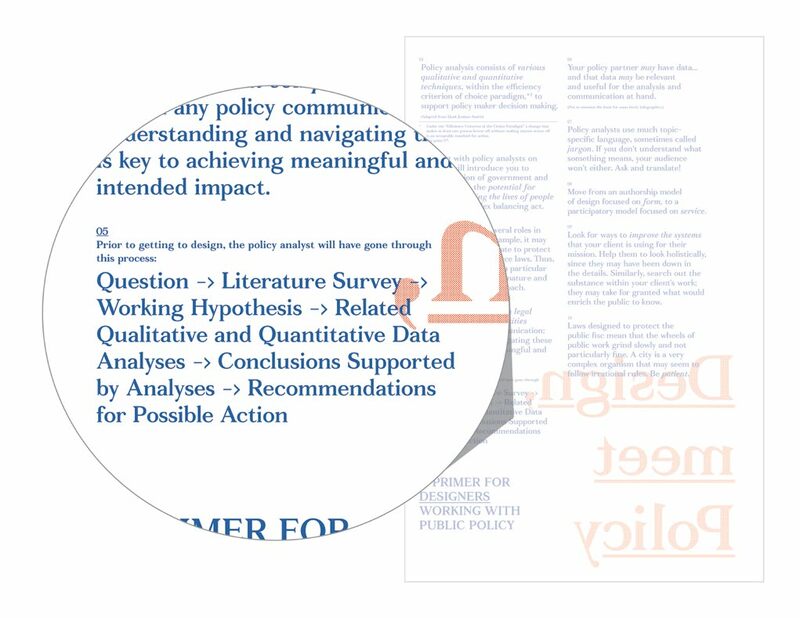 There was a risk of oversimplifying the contributions from 20 people into a single poster, but it serves as useful starting point for designers and policy analysts. 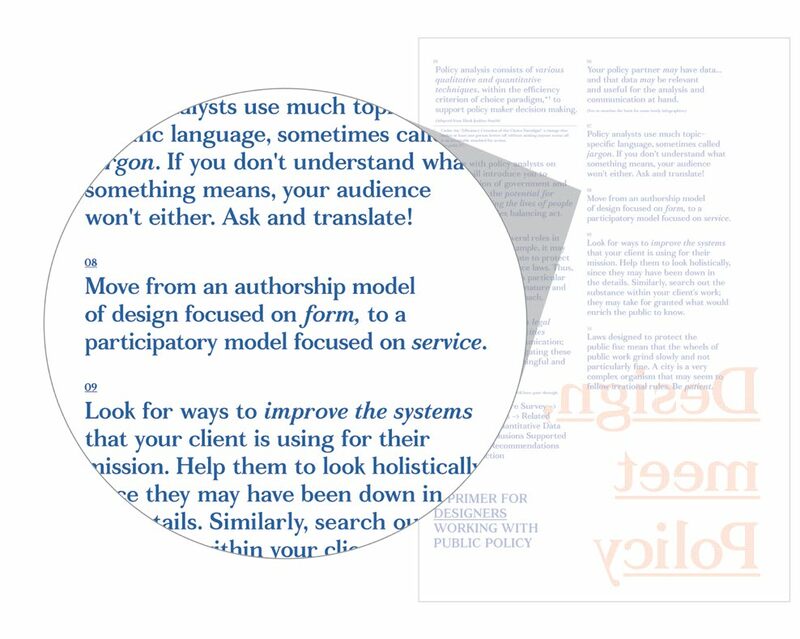 Before our spring 2014 class, I asked several experts and advocates of design and policy collaborations to look at the poster and talk about those tips they feel are particularly valuable, those that need more explaining,or insights that could be added. These included Bryan Boyer of Makeshift Society (who formerly worked at the Helsinki Design Lab), Megan Canning of the Design Trust for Public Space, Christine Gaspar of the Center for Urban Pedagogy, and Chelsea Mauldin of the Public Policy Lab. My teaching partners and I started our spring 2014 collaboration by discussing the poster in detail as a way of framing the semester and before partnering with a range of clients, including Brooklyn Community Board 14. 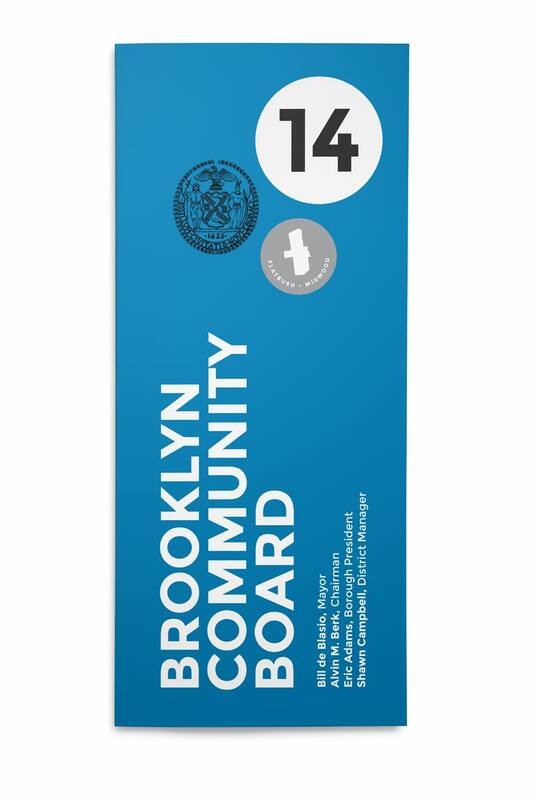 Community Board 14 serves the Central Brooklyn neighborhoods of Flatbush and Midwood. Students were excited by this partnership, since community boards serve as conduits between citizens and local government, which was alluded to on the poster. Residents can voice concerns to their community board about a variety of topics, from noisy neighbors to trash collection to potholes to high-crime areas. In a sense, community boards serve as neighborhood doctors who act on behalf of residents. 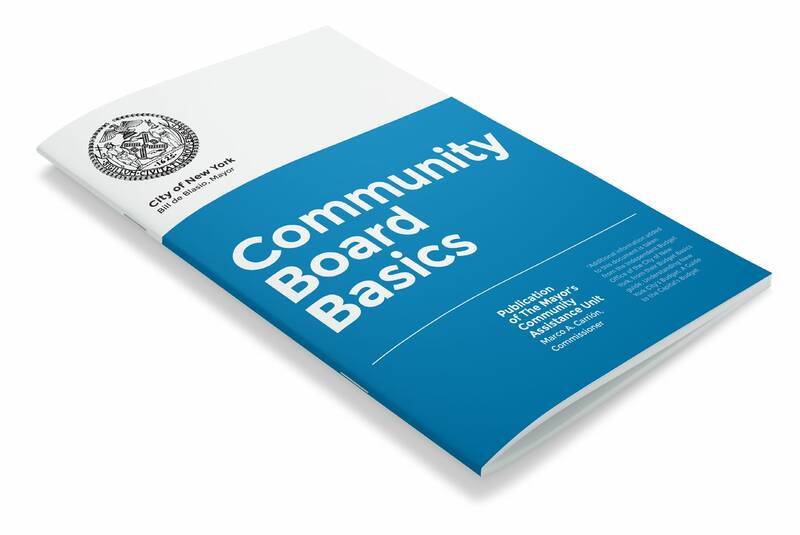 Community boards can be seen as the original and more local 311 system, which allows residents to make routine inquiries and voice non-urgent concerns. However, most citizens are more familiar with the 311 system than their local community board. This imbalance became one of our main goals. “Community members can lodge their complaints, concerns, and requests directly to a person knowledgeable about the locality by calling, e-mailing, or through community board’s website,” said Shawn Campbell, District Manager of Community Board 14. “The information that comes to the board and that is gathered through the 311 system are two pieces of the same puzzle. How to make the community aware of where the community board piece fits became one of the student’s challenges.” This challenge related to several design points on the poster about the importance of every design being appropriate to the intended audience. Design and Policy students presenting to Community Board 14. "How to make the community aware of where the community board piece fits became one of the student’s challenges"
The students seemed to understand the points on the poster, but were confused by the policy mandate, or creative brief, that kicked off the project. The mandate defined the challenge broadly and left students feeling overwhelmed and unsure of their goals. For these reasons, they started their seven-week project by defining the mandate more clearly, which limited the amount of time they could spend designing a solution that addresses these problems. This was an important first step. As Megan Canning, from the Design Trust for Public Space, put it: “...the better the brief, the better the final outcome will be. By doing a creative brief, the client is forced to articulate their main goals for the project, their audience and also their organizational personality, how they want this output to ‘feel,‘ and what they want the reaction or action to be as a result.” The students researched a range of issues to better define their brief: literature reviews, comparative analyses of NYC’s 59 community boards’ budget documents, surveys of NYC community boards’ district managers,and a review of the board’s community engagement and outreach materials. 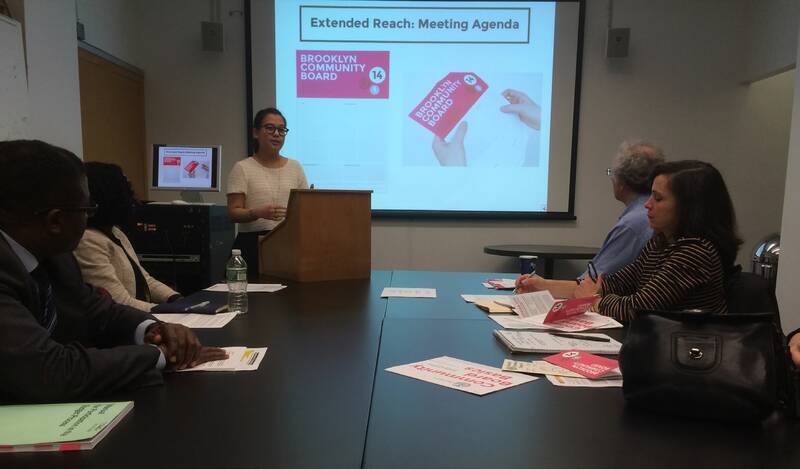 It became clear that Community Board 14 had several needs: (1) To collect and interpret the raw data that the board collects more effectively so that it can identify local trends, interests, and needs in community. (2) To improve how the board visually communicates its insights about the community to government agencies and decision makers that fund the board’s requests. (3)To identify new opportunities that better engage residents and organizations in order to increase participation. Fortunately, Shawn Campbell, District Manager of Community Board 14, was eager for the student’s recommendations, which can often be a challenge for these kind of large, often-bureaucratic organizations. 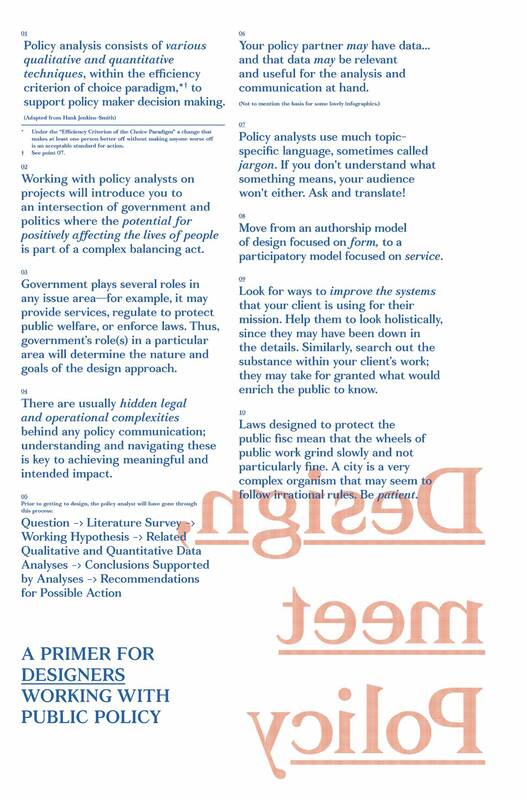 Christine Gaspar highlighted this fact, too, while observing that the poster largely focuses on helping designers work with policymakers from within an organization. As she put it: “A lot of times it’s important for designers to work from outside of government organizations since those organizations often represent the status quo. In order for the important changes to be made, voices from outside of the organization need to be heard.” The students distilled what they learned during this discovery phase into the “Central Policy Issue”: How can Brooklyn’s Community Board 14 use available data to strengthen its role in the city’s budget process and better engage with its community? The students compiled their recommendations into a document they called “Data-Driven Influence: Putting Dollars to Work at the Community Board Level.” To collect and interpret the raw data that the board receives, students suggested a range of solutions, from reorganizing spreadsheets to using data-collection programs such as SeeClickFix, QGIS, and Google Fusion. To present the data in more compelling ways, they pinpointed two key areas in the budgeting process where the board could better position itself: during agency consultations and in its budget documentation. The students also proposed a suite of new or updated visual designs to make the board more engaging to the community. With this in mind, and recognizing the time constraints of this project brought on by the need to revise the mandate, the design students redesigned existing materials in order to enable the board to improve the way both government officials and community members respond to it. The first of these documents was a brochure that explains what community boards do and how people can get involved. The original brochure’s outdated design used more jargon than graphics, which the students quickly noticed. It also lacked an engaging hierarchy of information that could help readers quickly understand the content. 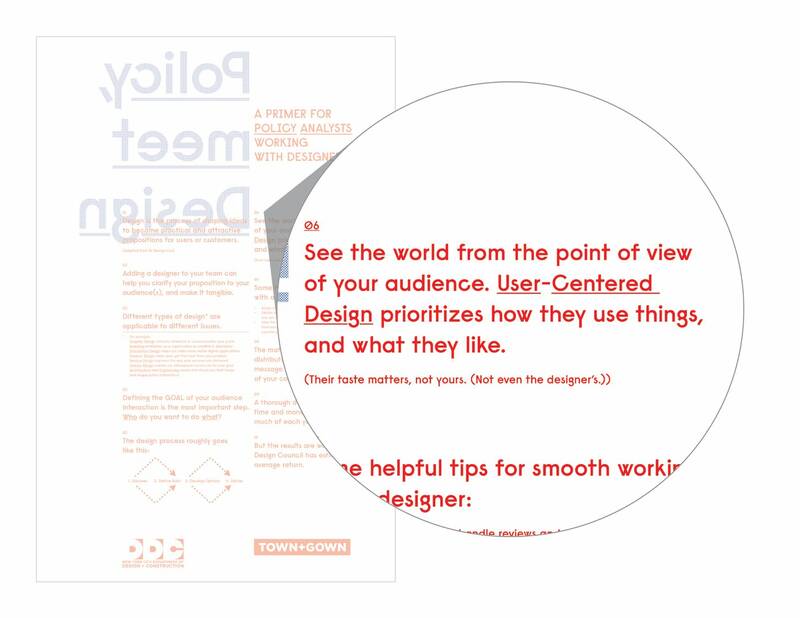 The students redesigned the brochure to include more color, an improved typographic hierarchy, a more interactive layout, and a call to action (which did not appear in the original version). The designs went through several iterations with feedback from Campbell. The brochure provided a kind of style guide that students used for a variety of other materials: a “budgeting basics” document, posters that could be used during community board meetings, and branded graphics that can be used for social media and on the board’s website. Detail from the "Policy. 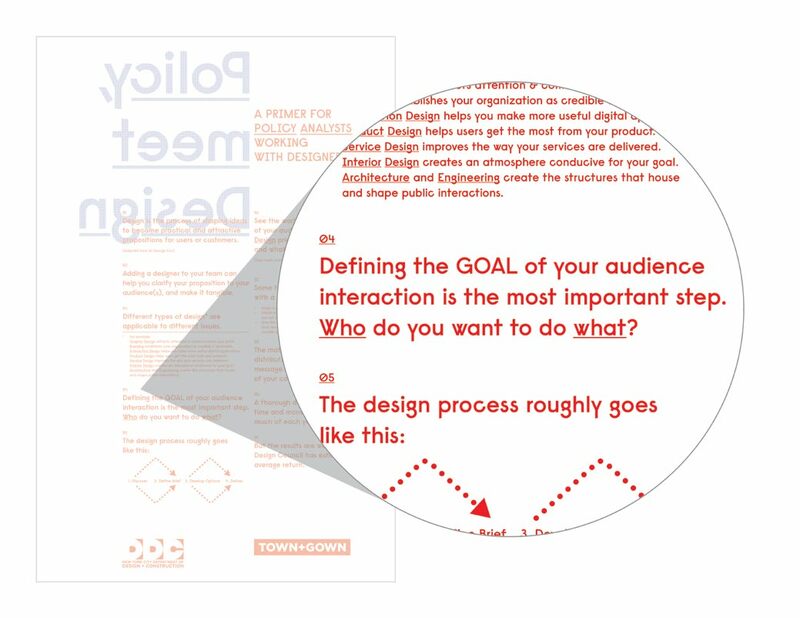 Meet Design" poster, focusing on the importance of participatory design. Because the students only had seven weeks to work on the project, they were unable to engage community residents in ways that could help the students ensure their recommendations would be effective over time. Public Policy Lab’s Chelsea Mauldin was quick to point out that this detail was also missing from the processes outlined on the poster: “There’s no mention about user engagement in this process, which is very important. 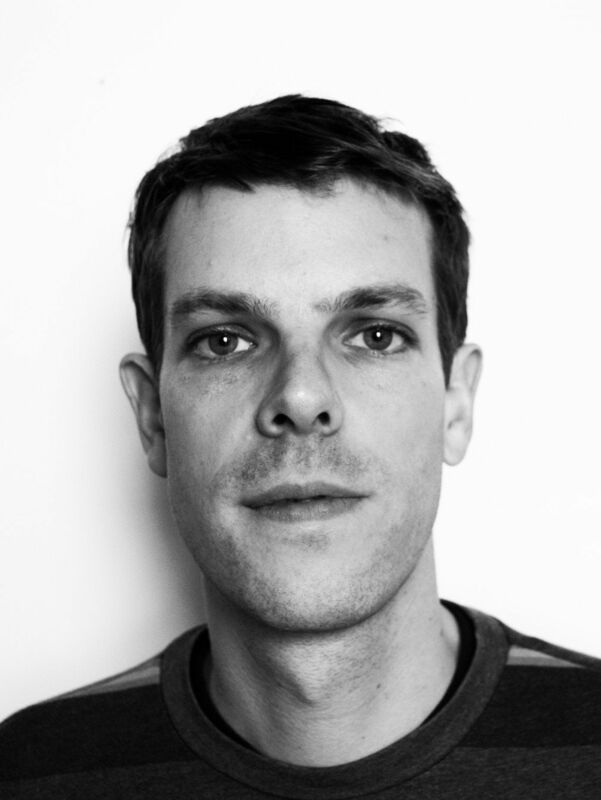 You don’t do use user-centric design without doing user research.” Makeshift Society’s Bryan Boyer echoed this point: “To have meaningful impact on a system, it’s important to understand and incorporate the needs of all users, and that means the civil servants as well as the citizens. Designers must assume a deep empathy for their partners working inside of these organizations, and get to know the constraints under which civil servants operate — political,financial, legal; internal, external — if they hope to play a role in changing the behavior of the system.”The students presented their recommendations at the end of the seven weeks, and Community Board 14 began to implement them soon after. 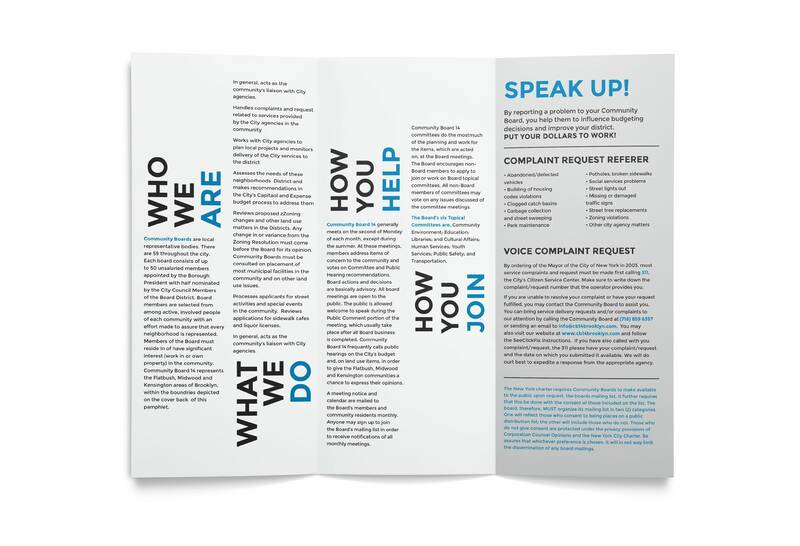 The brochures and materials have been printed and distributed to local residents, giving them more ways to be engaged and to get involved, and the board also hired a policy fellow to serve in an advisory role and to help it engage residents. According to Campbell, they are managing complaints better and have improved communication with fellow government officials. While the students read and reread the “Policy, Meet Design” poster many times and discussed the nuances of each discipline repeatedly, it will mostly likely take years of active cross-disciplinary collaboration before they will fully understand each tip and perhaps have a few of their own to add.After witnessing the potential impact of the student’s work with CommunityBoard 14, I hope to see more of these kinds of collaborations, and more local government agencies hiring designers not only to improve the visual impact of a service, but also to influence how that service operates as a system over time. To that end, any community board can download the community board design files, customize and use them to better promote their services and activities.